The Church, the mother of believers, continues to be mother and teacher to us as members of the Vincentian Family. A challenge we have before us is to form ourselves as catechists, and to form other catechists. This is a challenge that St. Louise confronted courageously and creatively. Each of us can deepen our faith, and in turn strengthen the faith of other believers, especially the faith of children and young men and women. In St. Louise’s time there was much religious ignorance. The ecclesial understanding of the faithful of seventeenth century France was, in general, weak. It is true that people lived in a society that was religious (different from our own society which is secular), but many people were ignorant about the truths of religion. St. Louise attained and lived an ecclesial understanding that was rare at that time. In our time, religious ignorance is even more noteworthy and obvious. The moral relativism that we see everywhere affects the faith and the lifestyle of many believers. Let us imitate St. Louise, who believed and experienced that she had received the gift of faith through the Church, and nourished that faith in others. The sources of faith are Sacred Scripture and the tradition of the Church. Louise read and meditated daily on the Scriptures, first with her family; later with the Ladies of the Confraternities and the Daughters of Charity. The Scriptures ought to be interpreted by the Church and not as Luther said, by free interpretation thus denying the ecclesial magisterium. Louise consulted Vincent about the books to be used during meditation, careful that these were approved by the Church. The catechism is important and necessary in families, parishes, and schools. Louise wrote a simple catechism on the truths of the faith, adapted for boys and girls in the schools of the Daughters. One should value the sacrament of Baptism as entrance into the church and as a sign of divine affiliation. Louise frequently mediated on the greatness of Baptism, and she wrote out her meditations as a way of instructing the Daughters of Charity. The consecrated bread and wine are the body and blood of Christ and not, as Luther stated, representations of Christ’s body and blood. Louise’s teachings on the Eucharist express the depths of her faith with regard to this sacrament. One should honor the Blessed Virgin and the saints because they are witnesses and models of the Christian faith. Louise’s writings state that the Virgin should be our only mother. They also contain numerous invitations to view the saints as models and witnesses. 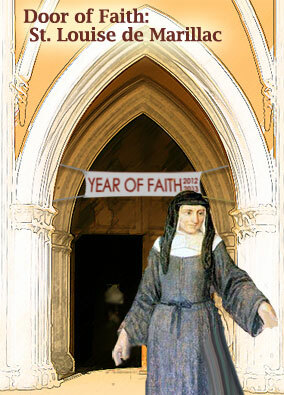 St. Louise lived with the conviction that the Church was inseparable from the Holy Spirit. Encouraged by this fact, she was a woman of the Church and wanted every Daughter of Charity and every member of the Confraternities of Charity to live as daughters of the Church. Therefore she asked them to adhere to and obey the magisterium of the Church and to respect the pastors and bishops. She herself lived this way. Nonetheless, when some pastor or bishop interfered in the mission, suggesting or demanding things that were not in accord with the gospel and its imperative to serve the poor, she courageously expressed her objections and disagreement. We see this in her relationship with the pastor in Chars, a follower of Jansenism. Louise’s unconditional adherence to the Church, the hierarchical body of Christ, is revealed and expressed in her respect and veneration of the Pope, the representative of Christ and the head of the Church. This attitude was also expressed in a letter that she wrote to M. Antoine Portail when he was in Rome: You are at the source of the holy Church and near its head, the Holy Father of all Christians. I have so often wished to be there in order to receive, as a child– though an unworthy one– his holy blessing (SWLM:202 [L.179]). She had hoped that before her death the Company of the Daughters of Charity would receive Pontifical approval. This, however, would not come about until eight years after her death.